Click in the miniature to see more pictures! 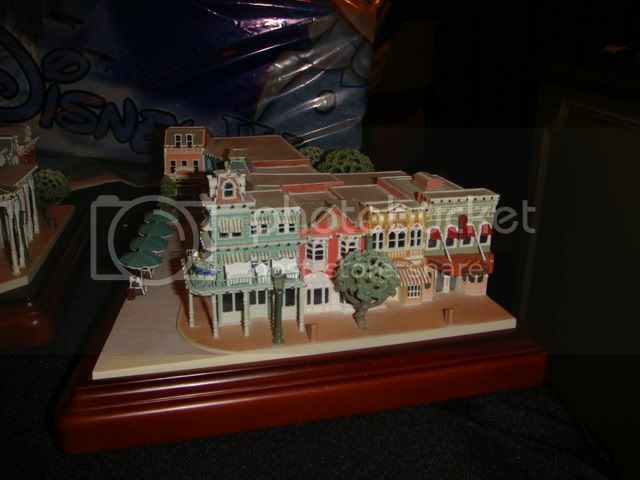 Our Walt Disney World® Resort Main Street Cinema and Uptown Jewelers Miniature by Olszewski is a state-of-the-art architectural model, exquisitely detailed with special lighting. Add it to your Main Street U.S.A. Area collection. 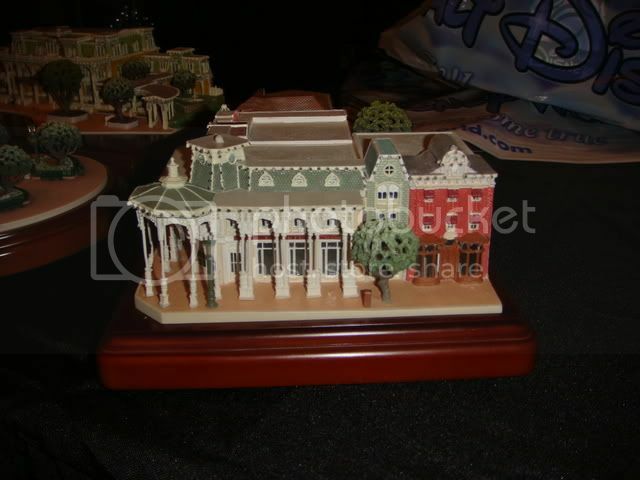 Our Walt Disney World® Resort Exposition Hall and Tony's Town Square Restaurant Miniature by Olszewski is a state-of-the-art architectural model, exquisitely detailed with special lighting. Add it to your Main Street U.S.A. collection. Our Walt Disney World® Resort Emporium with Car Barn Miniature by Olszewski is a state-of-the-art architectural model, exquisitely detailed with special lighting. Add it to your own Main Street U.S.A. Area collection. Robert Olszewski was born in 1945 in Natrona Heights, Pennsylvania. His natural interest in art developed early and was first demonstrated in painting and drawing. At age 16, he began winning awards for his work at local art shows, and was encouraged to pursue a career in art. Robert graduated in 1968 with a BS in Art Education from Indiana University of Pennsylvania, married and moved to Southern California in the same year to live near a major US art center and teach. While teaching he painted in the summers and at night. The security of teaching plus the free time, allowed him to experiment freely and develop his skills. He had his first one-man show at the Ryder Gallery on La Cienega Boulevard in Los Angeles at age 27. At the same time he enjoyed his young family and made toys for his children to play with. Along with the toys, he built a dollhouse for his daughter and this was his first introduction to the world of miniatures. His interest in miniatures turned from playful to a serious exploration of miniature figurative works as a new medium of expression. After 11 years, Robert left teaching in 1978 and pursued miniature figurative work full-time. Within a year his work was receiving national attention. In 1979, at age 34, Robert was brought under exclusive contract with the major European porcelain company, Goebel, maker of the world famous M.I. Hummel figurines, and was co-founder of the Goebel Miniatures Studios. As a master artist from 1979 to 1994, Robert oversaw the development of the modeling and painting studios, and watched the company grow from a staff of four painters in 1979 to 65 painters in a studio number 95 personnel. In 1993, a 30-year museum retrospective of his work was mounted at the Carnegie Art Museum in Oxnard, California, and in the same year Robert was named "International Collectible Artist of the Year." In 1994, Robert re-established privately owned Olszewski Studios and began exploring his art in a smaller studio to enable him to devote more time to his personal artistic growth. This new direction followed his personal artistic interests and reflected his love of exploring and combining new materials. In his early fifties, his move to an independent status left more time to pursue in depth his art and address those areas he had been waiting to explore. 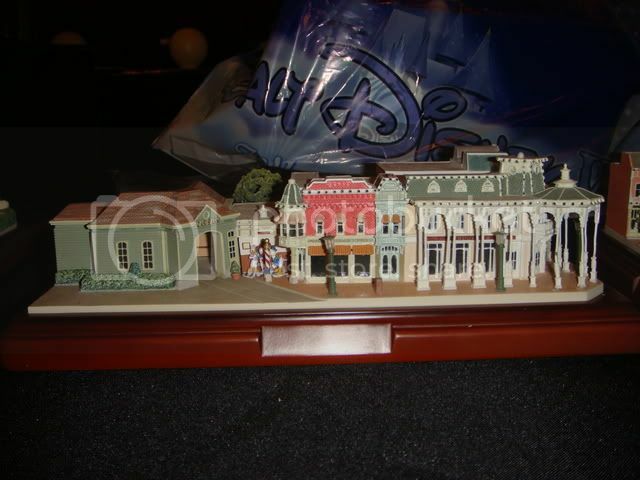 In 1995, Robert was commissioned by the Walt Disney Company to prototype miniatures for their Enchanted Places Program. In 1996, a second museum retrospective of his work was mounted at The Carole and Barry Kaye Museum of Miniatures in Los Angeles, California. 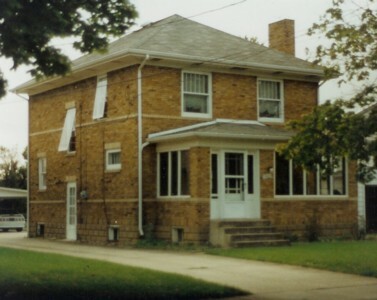 In 1998, Robert received the Distinguished Alumni Award from Indiana University of Pennsylvania and a third retrospective of his artwork was mounted at the University Museum. In 1999, Robert was commissioned by Indiana University of Pennsylvania to create a commemorative gift for their 125th Anniversary. Robert continued his close association with the Walt Disney Company as he was commissioned to design and create the commemorative gift to be associated with the opening of Disney/Pixar's A Bug's Life, in 1998. 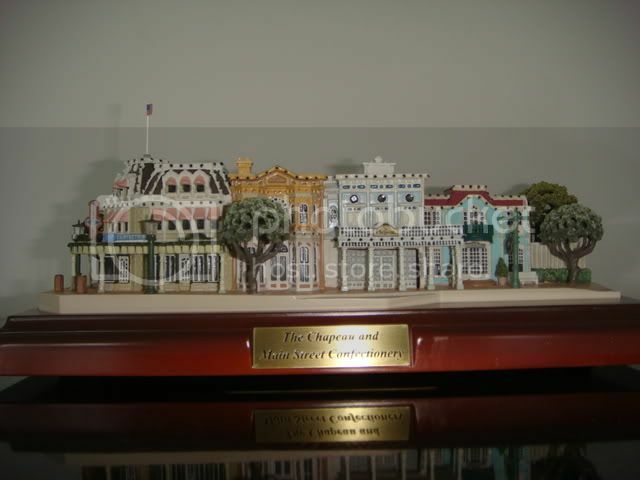 In 2000, Robert would introduce a new line of miniatures titled "Story-Time," which led to the invitation to create a special work for the 2001 Disneyana Convention. Steamboat Willie - Cast Members Premiere was successfully received and caught the eye of Disneyland's Product Development Merchandise Manager, Deanne Hill. Disneyland commissioned Robert and Olszewski Studios to design and create a scaled replica of Main Street, U.S.A. "Sleeping Beauty Castle" was the first piece in the collection and was introduced in December of 2002. To the present, in December of 2005, a total of 12 buildings, 4 vehicles and 4 character packs have been released to the general marketplace. Robert and Olszewski Studios have since completed Cinderella's Castle for the Magic Kingdom in Orlando, Florida and have begun work on the Main Street, U.S.A. for the Magic Kingdom in Orlando, Florida as well. 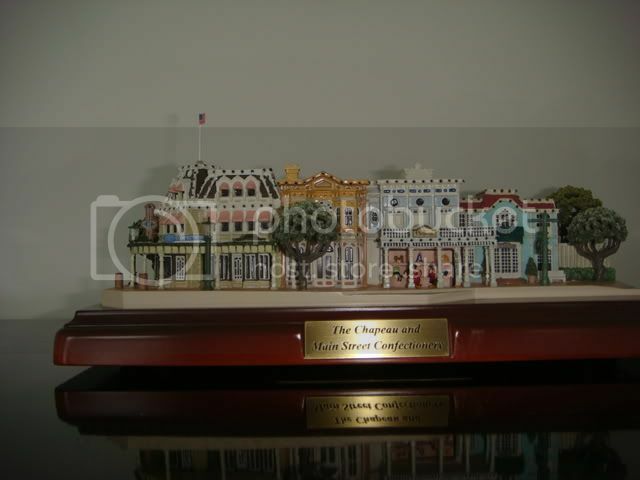 Adam and I started collecting the Olszewski Walt Disney World Main Street miniature collection by buying the Cinderella Castle piece back in 2005. After purchasing the next two pieces in the series back in 2006, it took Walt Disney World all this time to release their next three pieces. When they announced the date for the release and signing by Mr. Olszewski, we knew we had to go. We drove up from Miami and after some brief stops, we arrived at the Magic Kingdom’s toll plaza around 10:45 AM. The announcement from Disney noted that Mr. Olszewski would be signing the pieces at Main Street’s Art of Disney store from 10:00 AM till 11:00 AM, and then for a few hours in the afternoon. I wasn’t very optimistic that we would arrive in time for the early signing as we still had to take the monorail or ferry boat to the park. After going through security and the turnstiles, we finally arrived at the Main Street Cinema shop a few minutes after 11:00 AM. As this was our first experience with this type of event, I only had information from Disneyland’s previous releases as a guide. At Disneyland’s events, people wanting to buy the pieces would line up from before the park’s opening time and wait for hours in a queue to purchase the pieces. I was happily surprised upon entering the store to find only a few people in front of the display, the open cash register and Mr. Olszewski seated there. There were plenty of boxes in the back and the table was filled with Mr. Olszewski’s Main Street pieces, the Gallery of Light pieces and more. 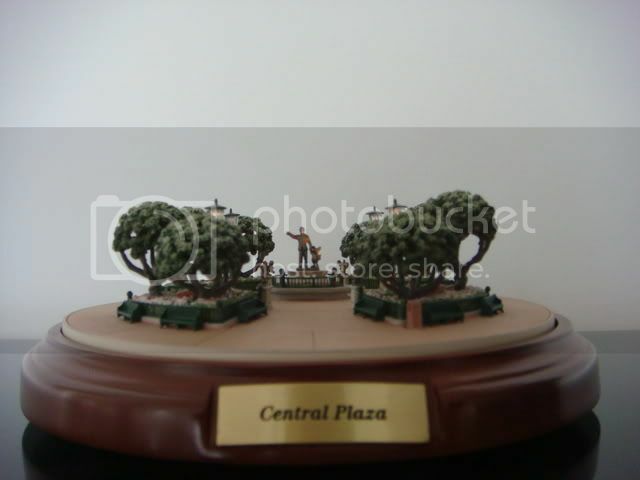 We quickly requested to purchase all three pieces and advised the clerks that we would take them with us, as opposed to having them shipped to the front of the park, to our resort (we weren’t staying on property this time) or shipped by common carrier. 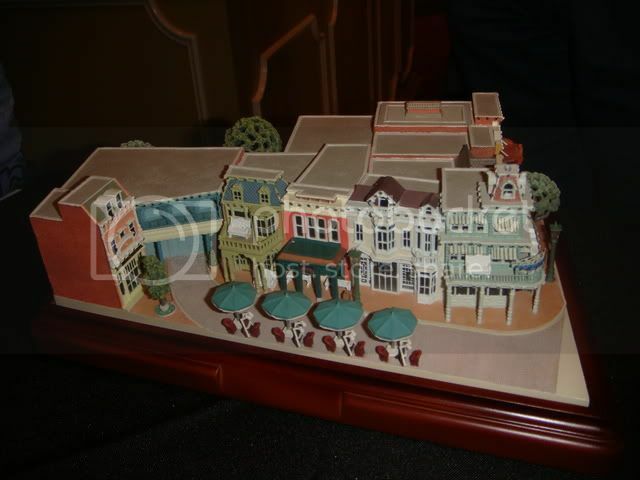 The three pieces that were being release were Exposition Hall with Tony’s Town Square Restaurant, The Chapeau and Confectionary and the Central Plaza – also known as the hub. The pieces were already signed by Mr. Olszewski. A cast member wrapped up the pieces for us, while we were paying and then waited to speak to Mr. Olszewski, who was sitting at the end of the table next to the first piece – Cinderella Castle. There were only four people before us, but as we learned, Mr. Olszewski was a wonderful man with many fascinating stories and loved to share them with his collectors. When we finally got our turn, we were able to spend some time discussing the collection, the future of the pieces, how he started his career as miniaturist and much more. We must have spent around 15 minutes talking to him and were even able to take some photos with him. 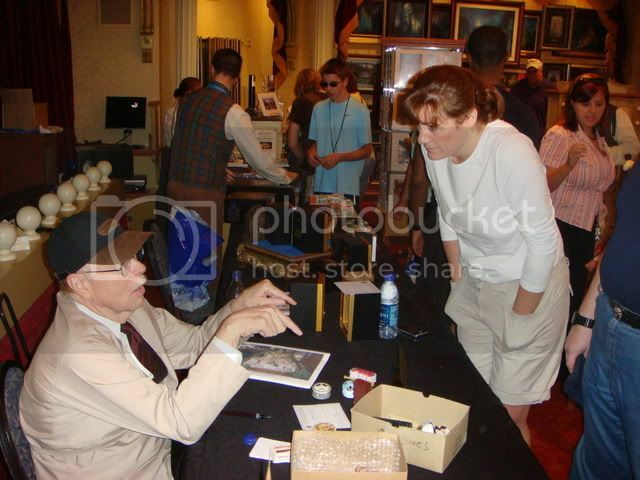 I am not sure we will visit Walt Disney World for every future release, as the added expense of the drive, tolls, hotel stay, park tickets and everything else is much more than ordering the pieces online and having them shipped home – but the pleasure of meeting Mr. Olszewski was priceless. Here are some photos from the event and of the pieces. The sign outside the Main Street Cinema / Art of Disney Store announcing the release. Exposition Hall and Tony's Town Square Restaurant. The entrance to what used to be the Walt Disney Story is on the right. 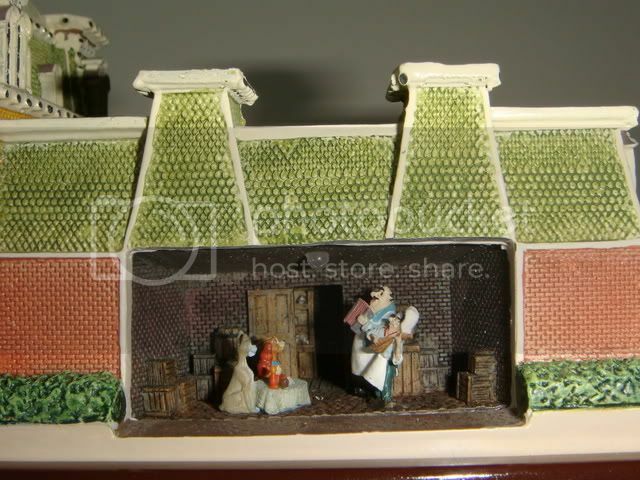 In the back side of Tony's Town Square Restaurant building was a tiny scene from Lady and the Tramp. According to Mr. Olszewski, each WDW piece will have a Disney scene like this or similar. The Chapeau and Main Street Confectionary. 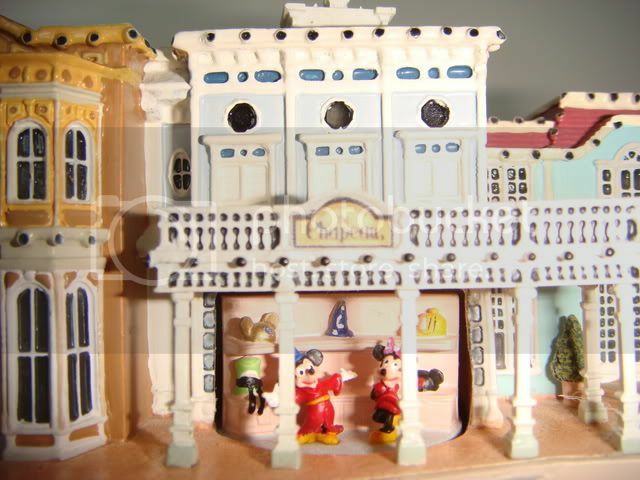 This view shows the hidden Mickey and Minnie inside the Chapeau store - with some miniature hats on display. Here's a close up shot of that. The Central Plaza (the hub) piece with the Partners Statue. Robert Olszewski talking to one of his new fans. 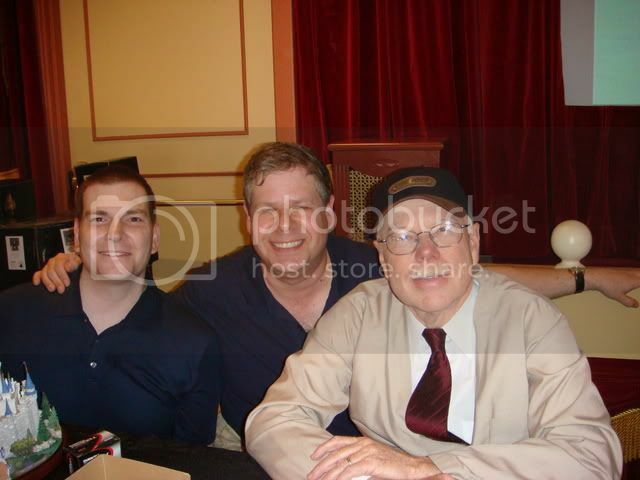 Adam, myself and Robert Olszewski - what a fascinating man! They also had two of the next release pieces. The Emporium with the barber shop. Notice the scene with Donald and Daisy. The side street next to Uptown Jewelers. Uptown Jewelers and the Main Street Cinema. I never thought that such things would exist! It's always cool to see these things which just existed on the big screen come to life as miniatures!